It is called Turkish bath or Moorish bath. Its origin dates from the ancient Greeks. The word comes from “hammam”,which means “heat” in Arabic. It is a damp steam bath. The steam bath area in Saint-Thomas includes three rooms at rising temperatures ,one of which is quite large and has a patio with a cold water pool (adapted to people whose legs feel heavy and heart patients) in addition to hot and cold showers. The aim of the steam bath is to relax and cleanse the skin by driving toxins away from the body owing to the humidifying air. Moreover it has effects on the respiratory tracts owing to the presence of eucalyptus essential oil. The steam bath is particularly recommended after a muscular activity ; it brings deep relaxation which is going to relax the muscles, soothe taches and problems of ligaments. It increases the body’s powers of recovery. During a steam bath, you sweat a lot, which makes you lose a lot of water ; so, you must compensate by drinking water. A cool water fountain is at your disposal in the hall leading to the steam bath area and a hot drink is offered in the tea room! You can relax just before and benefit from the outside thermal showers and hot water pools, and inner spas. Then push the door of the first room in the steam bath area. 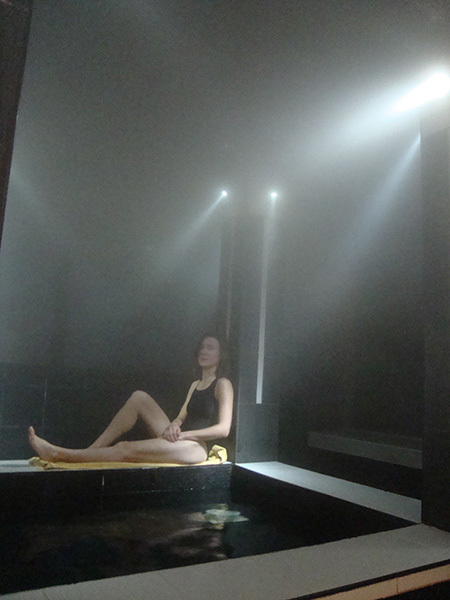 Tense people won’t resist : a humidifying steam at more than 40°C enables muscular relaxation. Sit down on the benches and take the time to let lighting effects and sometimes music lull you. It is hot but you can easily bear this damp heat.This is the place where you enjoy calm again, get to know yourself, pay attention to yourself, live for the day and you’ll have the opportunity to take your time. At this stage, the feeling of muscular relaxation is quite perceptible and under the influence of steam, the body sinks into a warm lethargy. But don’t fall asleep here because a relaxation area with deck chairs is at your disposal in the solarium. Don’t forget to freshen yourself up with the cold water showers at your disposal in the hot room. the steam bath area is also a place where everyone takes care of the body Using a body scrub allows dead cells to exfoliate and the skin to get fresh air. IMPORTANT : For hygiene’sake this practice is forbidden in the steam bath area but a shower is at your disposal for that in the hall leading to the steam bath area. The praticians propose the following option with a suggestive name ‘Travel in the heart of the East’: application of eucalyptus scented soft soap+body scrub +relaxing or tonic massage…That ‘ll take some doing!